David Saint was born in Jarrow in the northeast of England in 1954, and read music at Hull and Liverpool Universities. He studied the organ with Alan Spedding and Dame Gillian Weir. He gained his Fellowship of the Royal College of Organists (FRCO) at the age of 20, winning the Turpin Prize for Performance. 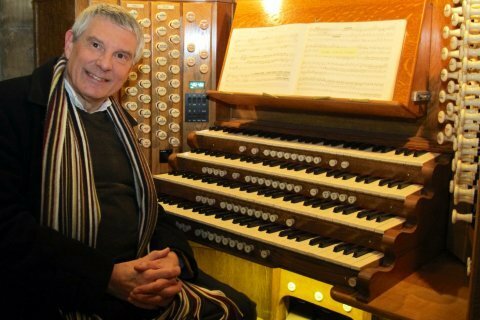 He has served as an active member of the Royal College of Organists (RCO) as Trustee. He served as Principal of Birmingham Conservatoire (now Royal Birmingham Conservatoire) until 2015 and is an Emeritus Professor of Birmingham City University. David is also Organist and Director of Music at Saint Chad’s Metropolitan Cathedral in Birmingham. He was recently appointed President-Elect of the Incorporated Society of Musicians, becoming President in 2018 / 19. David holds a prestigious Honorary Fellowship of the Royal School of Church Music; the Fellowship was conferred on him at Exeter Cathedral in June 2012. He is also an Honorary Fellow of the Royal Birmingham Conservatoire.